In January 2009 the Army’s authority to unilaterally apprehend and detain insurgents in Iraq expired. The Army now operates in Iraq at the invitation of the Government of Iraq (GOI). The change in the Army’s authority heightens the guiding principle of working by, with, and through the Iraqi Security Forces (ISF). The Army must work within the Iraqi rule of law when dealing with insurgents who threaten U.S. forces. It requires the Army to work with the ISF and the Iraqi court system to remove insurgents from the street. The Army must learn how the Iraqi system is structured and how its courts operate. The Army must also help educate the Iraqi courts, particularly the judges, on the science of how Americans collect and process evidence (forensics). Educating the judges on forensics is important to the Army having its day in court and its evidence entered into the proceeding against the insurgents. • Iraqi judges are the law within the Iraqi court system. Commanders must build relationships and trust with the Iraqi judges. Commanders must also help educate judges on internationally accepted techniques used in building a case for prosecution, especially with forensic evidence. • Commanders and staff judge advocates must actively seek the help of Iraqi local officials to learn how local systems operate because every province and district is unique. • Soldiers and leaders must be trained in the proper collection and processing of evidence, crime scene documentation, and the identification and handling of witness statements. • Leaders must understand the local warrant system since the first step in the Iraqi court system is to obtain a warrant issued by an Iraqi judge. • Commanders that task-organize assets for evidence- or warrant-based targeting will be most successful. Prosecution task forces are also an important tool. • Advice and practical lessons from subject matter experts in the institutional base and from the forces operating in theater are provided in this newsletter. When U.S. forces first entered into operations in the Iraqi theater, the coalition operated under a sequential series of United Nations Security Council Resolution (UNSCR) mandates and at the invitation of the Iraqi government. Coalition forces had unilateral authorization to detain any person posing a threat to U.S. forces or to the Iraqi population. The last mandate, UNSCR 1790, expired at the end of December 2008. Prior to the expiration of UNSCR 1790, U.S. forces began a gradual transition to operations by, with, and through the Iraqis and their security forces. On 1 January 2009, a bilateral security agreement between the United States and the Government of the Iraq was implemented. The coalition currently operates at the invitation of and under the rule of law of the Iraqi government. U.S. forces must adhere to Iraqi laws and the security agreement provisions before arresting or detaining anyone posing a threat in Iraq. The coalition’s responsibility is to follow the rules of the Iraqi criminal courts and judges to detain criminals and insurgents. A significant change to daily operations is the coalition cannot detain persons based on the perception of a threat. Before the security agreement, the coalition detained suspects based on its intelligence assessment of whether a suspect posed a threat to the coalition. Now the coalition operates using evidence- or warrant-based targeting. It requires cooperation between U.S. forces, Iraqi Security Forces (ISF), and Iraqi judges in the arrest and conviction of terrorists and criminals. U.S. forces must continue to use targeting methodology (find, fix, finish, exploit, analyze, and disseminate or F3EAD) to identify and convict insurgents and criminals. The coalition must learn techniques to translate collected intelligence into evidence that is acceptable to the Iraqi courts. Forensics is the primary method used by the coalition to develop evidence gathered at the crime scene. Using forensics is new to the Iraqi courts, which traditionally rely on eyewitness testimony as a means of conviction. It is the duty of U.S. forces to educate and to inform their Iraqi partners on the forensics process. In this newsletter, the reader is introduced to the background and use of forensics in the first two sections, Forensics Background and Battlefield Forensics. 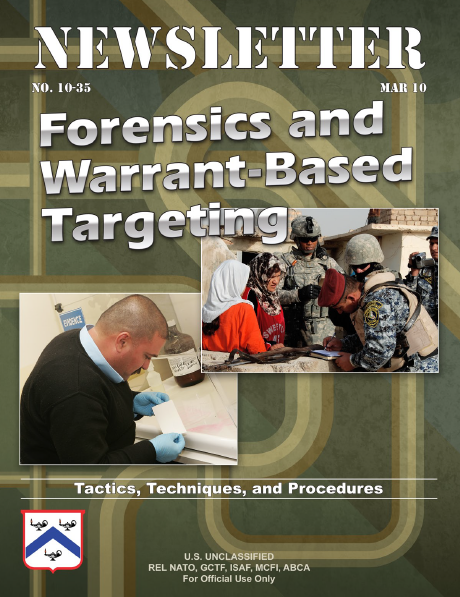 The articles in section three, Warrant-Based Targeting, provide a brief education on the Iraqi legal process and how coalition forces are adapting to working within the Iraqi system. This section includes discussions on how units and commanders develop solutions to partner with the ISF to obtain warrants to arrest and detain insurgents. Several examples are provided to demonstrate how commanders work with Iraqi judges, a critical factor in building confidence in the capability to work within the courts. The final section, Evidence Collection, highlights the importance of proper evidence collection and processing. This section offers techniques for conducting searches and evidence handling to minimize the risk of contamination. It also compares the difference between physical and testimonial evidence.